Modern Family actress Sofia Vergara got engaged to actor Joe Manganiello over Christmas 2014. The pair had been dating for over six months. 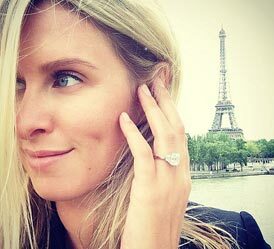 The sparkler on her finger appears to be a vintage-style platinum halo ring with a large oval cushion cut center diamond of 5-7 carat.